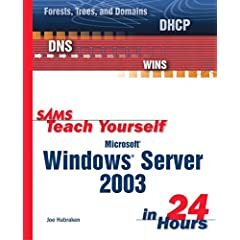 Sams Teach Yourself Microsoft Windows Server 2003 in 24 Hours is a straightforward, step-by-step introduction to Microsoft’s newest network operating system. This book not only highlights the functions and capabilities of the software, but also provides a practical hands-on look at important server features and tools. After reading this book you will have all of the information you need to get a Windows domain up and running quickly and easily.